The bus was scheduled to arrive in Chui on the border with Uruguay at about 8am. A lot of people got off and there seemed to be a lot of toing and froing just after 7. We were supposed to get off the bus to get our Brazilian exit stamps a few km outside Chui. I asked a passenger if he knew where we were supposed to do this and I understood his Portuguese response to mean “get off here!”. Apparantley they shut the Chui office a few months ago and this was the place to get the stamps. A couple a few seats in front who had been speaking in French asked if I knew what was going on and I explained what I had been told. On finding out that the border police was a taxi ride away we decided to share with the French couple. If we got there quickly the bus might still be there when we got back. On the way it was revealed that the bloke, Monaim was French but the girl, Karina was Danish. Alas the bus had departed by the time we got back but thankfully another one left for Chui a few minutes and we were on our way again. Chui (or Chuy if you're on the Uruguayan side) is a bit of a funny place. The physical border goes down the centre of the main street so you have brazilian shops on one side and Urugauyan on the other. I had been here previously and was happy to see that not a lot had changed apart from the quality of the merchandise in the shops on the Brazilian side. A cafe was open and we holed up for some coffee and pastries and then took turns minding the other couple's bags while the other had a wander around. I was quite impressed that Karina, who had been travelling for some 2 months, seemed to have all of her belongings in an array of plastic bags. They came back with a brand new rucksack, perhaps not unsurprisingly. Our turn to wander and we picked up a few bits and bobs to use up our remaining Reais such as cheap suntan lotion (in the hope that Uruguay would give us better weather than Brazil). Karina and Monaim (K&M) were planning to head to Punta del Diablo, (Devil's point), about 50km down the coast as well so we stuck together. As we drank mate in the square (more on Uruguayan mate in a sec) a slightly crazed looking woman approached us. First she offered a palm reading, which was politely declined, then pushed a bit harder and was refused more harshly. We left the park when she started asking for a “present” and another stranger approached this time selling socks and a set of knives. Anyhoo, we all caught the bus with K&M and agreed to see if we could find a cabaña (a little cabin) to share. I was really looking forward to coming back to Punta del diablo – having very fond memories from my time here previously. The weather picked up as we arrived in the sleepy, dusty fishing village that I remembered. There were a few more houses and a bit more development in general but not a hell of a lot had changed apart from the addition of a quite modern and suitably expensive hostel. We found a suitable cabaña easily enough, a lovely, rustic place painted in yellow complete with a parilla and a few cute little dogs for company. It even had an ingenious car seat belt based device for locking the sliding window. We put the parilla to full use the first evening although slightly embarrassingly had to request the assistance of our next door neighbour in getting the fire going. What appeared to be a stray dog hung about all night looking for scraps – we christened him Whiskey and he pretty much became a constant companion for the rest of our stay. It lashed rain for the whole of the next day so we stayed in, played cards, taught K&M cacho and watched some TV. It was a real rainy day on your holidays, reminding us both of camping in France somehow, except without the tent. We were treated to a great spag bol by K&M. The following morning I found a 10 real note i didnt know I had in my pocket and as K&M were heading back to Chuy for the day I set them a challenge. Get 10 reais worth of surprise for us. The weather still wasn't great – very windy but clear. Claire and I went for a long walk up the beach to a lighthouse as the waves battered the shore, leaving a strange ice-cream like foam on the beach and rocks. We had the beach (of about 4km) practically to ourselves. The guys had returned by the time we got back, replete with surprise which I have to say was certainly surprising: a massive, 7.5 kg watermelon and a packet of strange Brazilian biscuits which essentially were some peanuts smothered in sugar. Another 7kilos to carry. Great! The crap weather continued the next day so I took advantage of the new hostel by using their internet to research my ipod problem and see what the linux geeks said about it. I'll spare you the rest (it got a lot worse). It was looking like I was going to be carrying around an expensive paperweight for the next 10 months. That evening we were lucky to have enough clear sky to catch a beautiful celestial event. 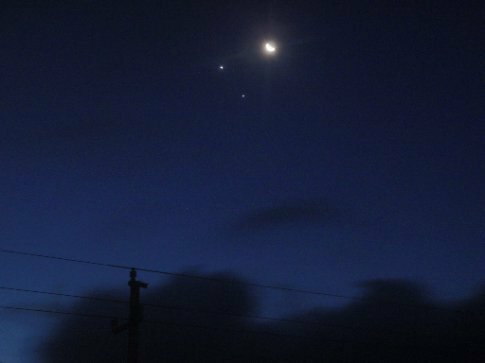 The moon, Venus and Jupiter, the three brightest objects in the night sky, were all alligned in triangle, like a tunnel through the solar system. Even managed to get a decent photo. Excellent flame grilled bangers and skin-on mash for dinner. So nice to be able to cook for ourselves... Hoping for better weather we packed up and moved on a few miles up the coast to a place I had heard lots about but never managed to visit last time round – Cabo Polonio.